Lyricspack Ads is an adware program and it is not considered to be an immediate security threat. However, computer safety experts strongly recommend removing Lyricspack Ads from your computer as this application displays an excessive number of commercial pop-up ads that may prove to be detrimental to your system security. The main security issue related to Lyricspack Ads involves the possibility of malware exploitation, and if that happens you can definitely get infected with dangerous computer malware that will desolate your system and even steal your money. 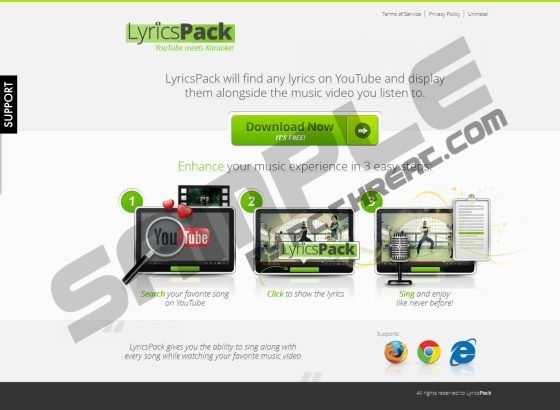 In general, there is not that much new about Lyricspack Ads as this adware application belongs to the Lyrics group of browser extensions which includes Lyrics Fan, Boby Lyrics and even Adware.AddLyrics. This extension provides you with the lyrics for a song you listen to on YouTube. Lyricspack Ads displays lyrics the music video’s right and you can choose whether you want to close or open the lyrics pane. Nevertheless, the lyrics are not the only thing displayed by Lyricspack Ads, as the program also generates a string of commercial ads. These pop-ups are the thing that can expose you to potential threats and therefore you must remove Lyricspack Ads. Some users think that Lyricspack Ads infects their systems behind their backs, but that is not exactly the case. Since the application has an entry in the list of installed programs, it suggests that user installs the program on the computer himself/herself. That could be the case especially since Lyricspack Ads is often downloaded with freeware programs from third party websites. Hence, if you are about to install a free of charge program, make sure that you read each installation step carefully and you do not miss the piece of information that informs you about Lyricspack Ads. After the installation, Lyricspack Ads is added as a browser plugin to Mozilla Firefox, Google Chrome and Internet Explorer. Then the application carries on displaying lyrics the moment you access any YouTube video. It is possible for your browser to slow down especially if there is an onslaught of third party commercial pop-ups. Be sure to steer away from them since they may be embedded with corrupted content. It is not Lyricspack Ads’ objective to infect you with malware, but the application cannot review all the ads it displays and so it is up to you to terminate the application and protect your PC from harm. Below you will find instructions on how to uninstall Lyricspack Ads from your computer manually. Once you have done that, run a full system scan with SpyHunter free scanner. This way you will check whether there are any other potential threats installed on your PC and you will be able to get rid of them immediately. Go to Uninstall a program and remove LyricsPack. Click Uninstall a program and remove LyricsPack. Select Add or remove programs and uninstall LyricsPack. Quick & tested solution for Lyricspack Ads removal.